Here is an excerpt from a story about me and Dieter, written by Deena Yellin, published today in The Jewish Standard! When Teaneck author Helen Maryles Shankman dug into her family history, she hoped to unearth stories about her ancestors’ experiences during the Holocaust. But the award–winning author never anticipated that she would discover a Righteous Gentile. 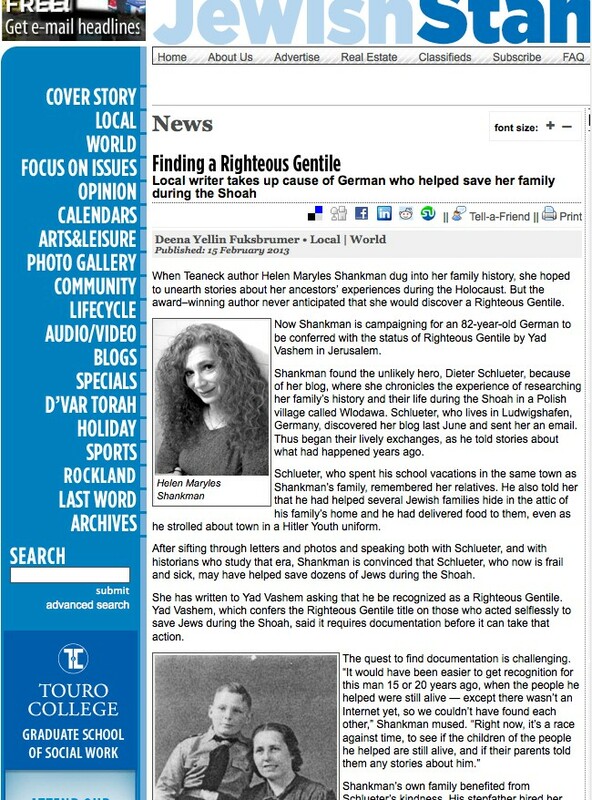 Now Shankman is campaigning for an 82-year-old German to be conferred with the status of Righteous Gentile by Yad Vashem in Jerusalem. Shankman found the unlikely hero, Dieter Schlueter, because of her blog, where she chronicles the experience of researching her family’s history and their life during the Shoah in a Polish village called Wlodawa. Schlueter, who lives in Ludwigshafen, Germany, discovered her blog last June and sent her an email. Thus began their lively exchanges, as he told stories about what had happened years ago. Schlueter, who spent his school vacations in the same town as Shankman’s family, remembered her relatives. He also told her that he had helped several Jewish families hide in the attic of his family’s home and he had delivered food to them, even as he strolled about town in a Hitler Youth uniform.